A place to keep track of what your East friends are up to and to share milestones in your life with your classmates and all East alums. Graduations, weddings, reunions, babies, new jobs, retirement, grandkids, that chance encounter at the base of the Eiffel Tower with another Pioneer. Just send what you want to share to the Class Agent listed for your year. Don’t see a class agent listed? Sign up to be one by emailing Maria Allen or calling (616)235-3535. Click the decade to jump to more about each class within that period. Ben Waters (left) and Keith Takens (right), freshmen in Ferris State University’s Digital Animation and Game Design program, show off their gold medals from the SkillsUSA 3-D Animation and Visualization competition. Waters and Takens competed at the National Leadership and Skills Conference held June 24-28 in Louisville, Kentucky. Exciting news for Alexandria Lian Walschots! She is in a feature film, and one of the lead actors, playing Alice in a family movie called Sk8 Dawg. It is available OnDemand, Amazon and iTunes, and at all Targets and Walmart, even showing in Europe. It has a good message and for all ages. Alex has also done an episode for NBC’s “Disappeared”. Her future plans include “Friends with” Snow White in the coming year at Disney World Orlando. Stephanie (Stevie) Triesenberg became private pilot on December 7, 2018. Stevie Triesenberg upon earning her pilots license. 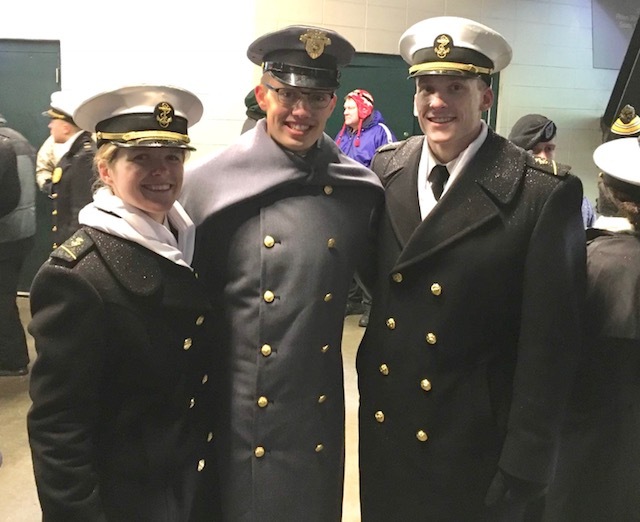 2016 EGR Alumni (l-r) Midshipman Georgia Deems, Cadet Nathan Hein and Midshipman Andrew MacGregor met up at the 118th Army-Navy Football Game December 9, 2018. Sam Forstner and Sam Adams sent this picture from their trip to Sweden, Denmark, and Germany in June. The photo was taken on a spiral staircase on the outside of the spire of the Church of the Savior overlooking Copenhagen. 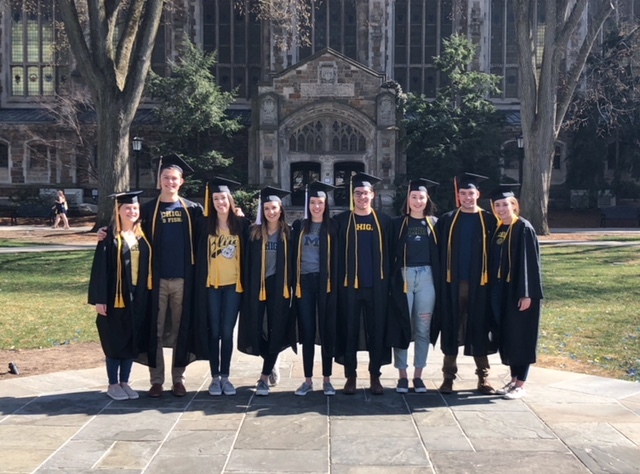 Here are nine of the Class of 2014's new University of Michigan grads: Caroline Kremers, William Laffrey, Laura Donohue, Dakota Bernard, Allaire Donohue, Peter Mack, Katie Keane, Joe Donohue, and Sophie Brown. December 22, 2017 at Gray Skies Distillery 9pm - Midnight. Congratulations to Daniel Herington, who got married in October 2016. Contact Natalie Fratto, Max Mikelic, or Meredith Rizzo with any questions. Ian and Veronica McDonald welcomed baby Pierce in September. They currently reside in Stafford, Texas. Congratulations to Kaitlin (Ronda) Merpi for receiving the Excellence in Education award from the Michigan Lottery. Katherine Khorey and a friend won Chicago Startup Weekend back in April. They’re working on launching their platform now. It's a mobile app for short stories: updates are on the Shortfics website. Valerie (Walworth) Dawson has two children: Ana Ray, 3, and Maximillian, 1. Her new address is 1513 Sterling Oaks Dr Moncks Corner, SC 29461. Irene (Casillas) McKenzie and husband Taylor bought their first condo in Chicago. Irene works at Ann & Robert H. Lurie Children's Hospital as a nurse practictioner for a pediatric brain tumor program. Her husband Taylor recently started his own lighting company called McKenzie and Keim (based in Chicago). Alex (Fairchild) Oates and Tyler Oates welcomed baby Olivia in July. Kayla (Kalmbach) Williams and husband moved back to Michigan in June 2017 after spending 2 years in China. Marla (Kalmbach) Woodward is completing her MBA at the University of Oxford in cold and rainy England. Rachel Shapley married Steven Brusca summer 2017 here in Grand Rapids, Michigan. They live in Hoboken, NJ. 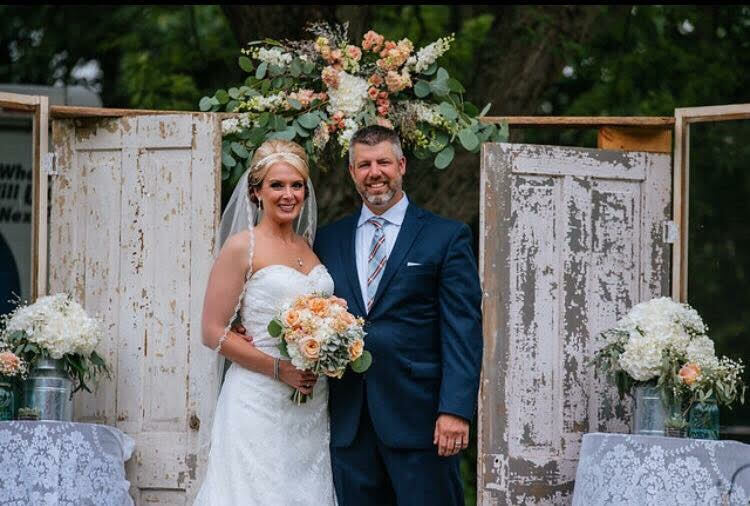 Casey Milroy married Michael Beaudoin summer 2017 in Milwaukee, WI. She is completing her masters in education through the University of Wisconsin. Natalie (Corbett) McCarty is completing her masters through the George Washington University family nurse practioner program. Kelsey (McDonald) Macintosh and her husband Kyle welcomed baby #2, Eva, in October, 2016. Mary Fix is having a big year as a photographer. Her work is being featured in Elle Mexico, Nylon, Elle Indonesia, L'Officiel Singapore, Eileen Fisher, New York Magazine, etc. To see more, her web site is www.maryfix.com or you can follow her on instagram @maryfixfix. John Abraham graduated from Harvard Law in the summer of 2016. Anna Gering Vandenburg and Eric Vandenburg, both ‘03, had a baby girl and moved back to Grand Rapids last year. Dylan Cassard and his wife had a baby girl. Dylan also accepted a job as the Presentation Technology lead at Celebration Cinema North. Jennifer Walworth is getting married in August. Courtney Rawlings Brown got married on April 14th and is spending her honeymoon in Ireland, the UK, and Rome. She lives in Zeeland and works at Magna Mirrors in Grand Haven as an advanced manufacturing engineer. Megan E. Smith Jovanovich traveled to Kyoto, Japan in April with her family, including sisters Jennifer (‘04) and Abby (‘09), for their brother, Andrew’s (‘09) wedding. Katy Schousen and Sean Roslaniec, both 2003, currently work at the same hospital in Seattle. Nick Schultz and his wife, Laura, retired from professional ballet dancing with Grand Rapids Ballet in December and have relocated to New Zeeland with their 2 year old to work as ballet masters with the Royal New Zeeland Ballet. Traci Corl Millet has gone back to work at Lakeside Elementary after being a stay-at-home mom for 10 years. After taking some time to travel this spring, Shannon Sutton made a career transition from advertising to residential real estate in Chicago. Tricia Somerdyke put together a 3-on-3 basketball tournament for her daughter, whose team beat East Grand Rapids. Shelly Swainston Houghton bought a house and started her own kitchen cabinet re-finishing business. She also spends time with her 3 kids playing soccer, and with her husband who is almost one year cancer free. Sarah Faasse is getting married in Grand Rapids in November. She is also working on her pediatric gastroenterology internship and applying for pediatric transplant hematology internships. Allison Miller Kaulfuss lives in Rochester Hills with her Husband and 1-year-old daughter. She currently works for Steelcase, but is transitioning into a role at her family’s business, Grand Rapids Chair, as a member of the product development team. Katie Lich MacCallum recently returned to work in Pharmaceuticals for R&D after staying home with her kids for 4 years. Sam Rhodes Verplank is living in Spring Lake and working in real estate. Rosa Vinas Crawford lives in Colorado with her kids. She is a portfolio manager and real estate broker. In her free time, she trains and performs circus acrobatics. Anna Estrada Bullis lives in Cascade with her husband and four kids. She stays busy homeschooling her kids and working part time in financial services. Brienne (Ritzenhein) Postema has helped open Carolina Lowcountry Kitchen in Gaslight Village! GR Magazine article featuring Brienne. 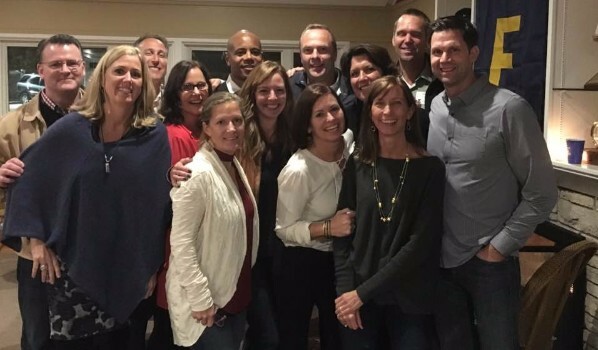 The Class of '97 celebrated its 20th year since graduation with a reunion at H.O.M.E. in The BOB Saturday, August, 5, 2017. Over 90 Pioneers (excluding those still serving a study hall detention) gathered for food, fun and friendship. Truly a wonderful evening of renewal for all. Reunion activities continued Sunday with a tour of the high school and a family picnic at Manhattan Park. Contact Sarah (Marshall) Straveler at egrclass1997@gmail.com for more information. John "Jack" Becker visited East from his home in Virginia Beach. While in town, he introduced his kids to the Jimmy Gerken statue in Gerken plaza. From Class Agent Margo Toms: "Jackie (Campbell) Hanson is opening a yoga studio in Versailles, KY, called 'Yoga Room.' It turns out three people from our class live in KY: Jackie, Megan (Dembinsky) McFarland, and Mike McColl." Aaron and Amy (Bearss) Kaufman welcomed Oliver Baron Kaufman into the world on Sept. 5, 2017 at Lenox View Hospital in New York City. Oliver weighed 8lb. 14oz. and is the couple’s first child. 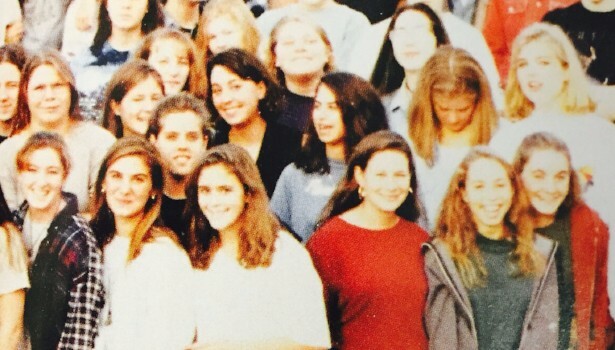 Class agent: Please contact Maria Allen if you are interested in being the '89 Class News Agent. 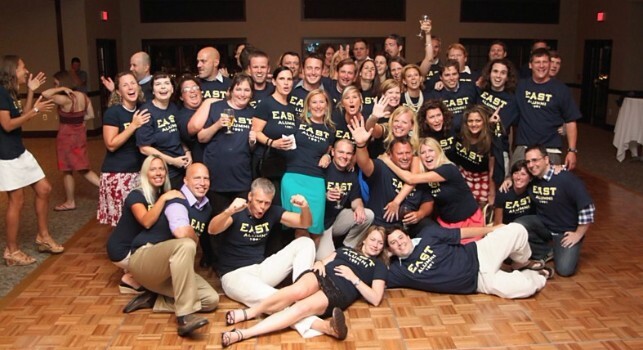 The East Grand Rapids High School - Class of 1989 Facebook page has additional information. Update your contact information with the East Grand Rapids Schools Foundation to receive more information as the event date gets closer! Contact Cheri (Morse) Reid and Trish (Meade) Reid, with any questions or if you would like to sponsor or help with the reunion. 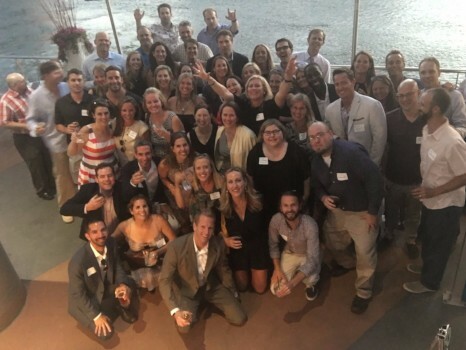 The Class of 1988 30th Reunion was held on September 28-30, 2018. When Hurricane Michael tore through Mexico Beach, displacing families and leaving destruction behind, restaurant owner and chef Dave Snyder knew exactly how to help. Read the article about Dave. Class agent: Please Contact Us if you would like to be the 1979 class agent. 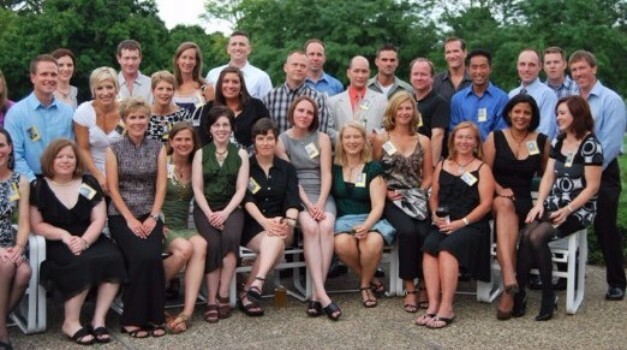 45th Reunion - June 14-15, 2019. Contact Anne Chamberlin for more information or to assist with the events. Class agent: Please Contact Us if you would like to be the 1978 Class Agent. 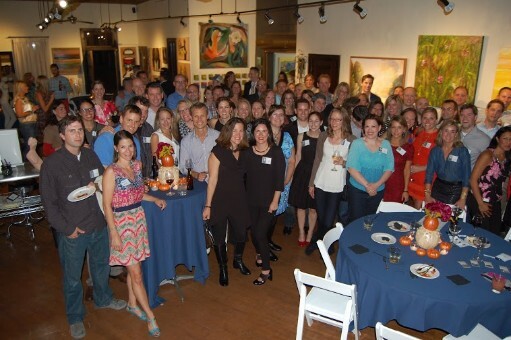 40th Class Reunion - October 4-5, 2018. 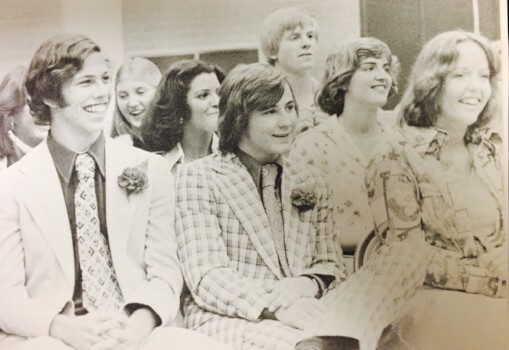 In conjunction with the Class of 1978 upcoming 40th reunion, the '78 alumni would like to remember classmates who have passed by making a class gift to the East Grand Rapids Schools Foundation in the name of the Class of 1978 Memorial Gift. Classmates who donate to the gift will have their names included as such, along with a list of all 20 of our departed classmates, in the Spring 2019 edition of the Foundation’s newsletter. Your tax deductible donation can be made as follows. Please be sure to include a matching gift form from your employer if applicable and to also reference your donation as a Memorial Gift for “Class of 1978” when making your contribution. 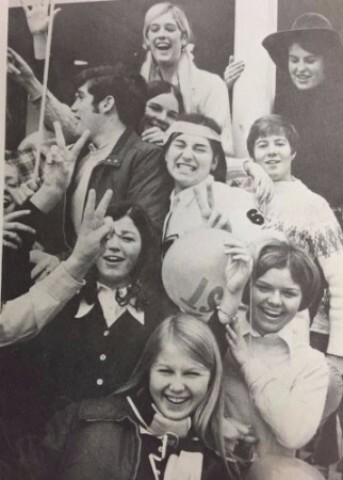 We hope you will join us in celebrating our 40th reunion by giving a little back to good old EGR while at the same time honoring all of our classmates who have gone before us. Questions regarding any of this can be directed to either Jim Fuger (jimfuger@me.com), Maria Allen, Alumni Relations Coordinator EGRSF (mallen@egrps.org). From Elisa Joseph Anders: “A huge round of applause for our awesome classmate, Corrine Leistikow!!! 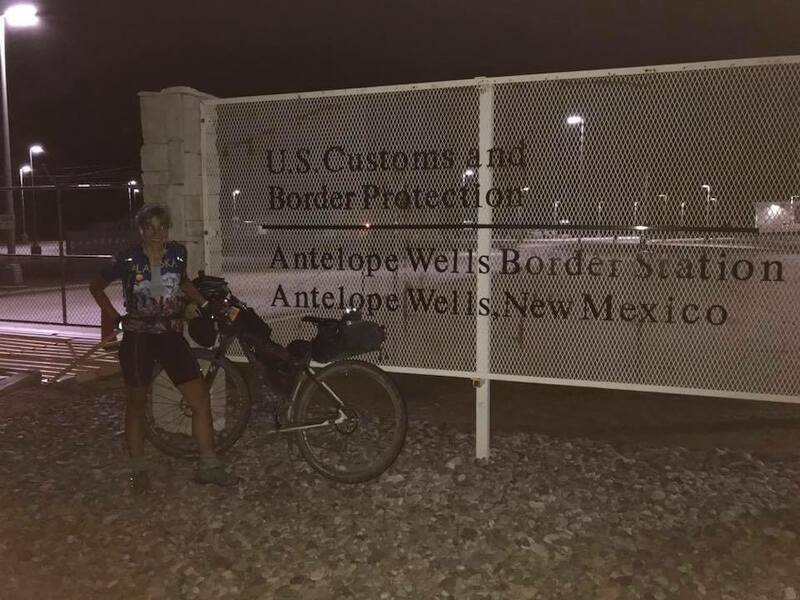 She just biked the Tour Divide, an ultra-cycling challenge to pedal solo and self-supported the length of the Great Divide Mountain Bike Route—2,745 miles from Banff, Canada to the Mexican border in New Mexico—as fast as possible! She finished on Sunday night just before midnight on the 30th day. WOW!!! Congrats, Corrine!!! Surely this puts you into the EGRHS ’77 Hall of Fame!" The "Gerald T. Hart Outstanding Tax Attorney of the Year Award" is presented annually by The Florida Bar Tax Section to the individual who has made “major contributions to the advancement of the practice of Tax Law and who exemplifies the highest standards of competence and integrity.” Bowers, a shareholder and Board member of Jones Foster, is a Florida Bar Board Certified Tax Attorney. He has over thirty years of experience in estate planning, business planning and tax planning. He is a former Chair of the Tax Section of The Florida Bar (a member for over 30 years); former Chair of the Tax Law Certification Committee of The Florida Bar; former Chair of the Palm Beach Tax Institute; and former President of the Palm Beach County Fringe Benefit Council. He earned his law degree from Ohio Northern University and his LL.M. from the University of Florida (1981). David is a graduate of East Grand Rapids High School 1973 in Michigan. In spring 2015, Katie Tinkham Scheffler Lannamann, received the Planned Parenthood of Southern New England’s Everyday Hero Award. From a Facebook post at that time by her daughter, Liz Scheffler, “My mom has worked tirelessly for years for women's reproductive justice and I couldn't be more proud to be her daughter. Always passionate about women's rights, she has fought for reproductive justice with several organizations. She is a founding officer of the Religious Coalition for Reproductive Choice of Connecticut.” Katie earned her law degree from the University of Michigan in 1978 and currently lives in Florida where she manages the Florida Interfaith Coalition for Reproductive Health. Just this past April 8, 2018, Dr. Laura Cowan received the Steve Gould Award from the University of Maine. The award was created in 1981 by the family and friends of Steve Gould in memory of “a man of honest and passionate concern for others.” The award is given to those who have demonstrated superior qualities of unselfishness and compassion in the course of service to the university and its ideals. Her nomination noted “that in her three decades as a member of the UMaine community, Cowan has been a leader, role model and mentor supporting women colleagues, students and staff, and committed to effecting positive change.” Laura received her Ph.D. from Princeton in 1988 and is an Associate Professor of English at the University of Maine. She has served as the department chair and graduate coordinator. Cowan’s research focuses on literature and the environment, modernism and feminism. Her latest book is on feminist writer Rebecca West; her next volume will be on Rachel Carson. In business news, Jeff Dixon joined Legacy Trust as Senior Vice-President for Senior Portfolio Management in September 2017. Jeff has over 30 years’ experience in portfolio management, previously working for Comerica Wealth Management in Grand Rapids from 1987 – 2017. Jeff serves as a Board member and Executive Committee Treasurer for Mercy Health St. Mary’s. Contact Susan Kasma for reunion information. Shelley (Allen) Kohorst writes: "My husband, Bob Kohorst, has been appointed the U.S. Ambassador to the Republic of Croatia. We leave January 9th for our post." 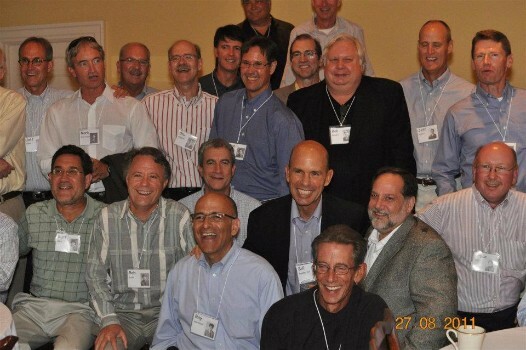 Contact Jeff Hudson for additional reunion information or to update your contact information. A special evening celebrated by the '67 alumni at Kent Country Club September 30, 2017. "In June of 2017, I traveled for three weeks in Alaska with a friend with whom I have done a number of adventuresome trips. For the first 10 days, we rented a little Nissan pickup truck and traveled overland from Anchorage up to Denali (formerly Mt. McKinley), to Fairbanks and back to Anchorage to get our flight to Haines. There we met our group of 8 others (plus 3 guides) for 13 days of rafting in some of the most remote parts of both the Yukon Territory as well as southeast Alaska where we ended the trip. One of the most surprising things to me was that we didn’t see one other person the entire time! That’s how remote we were. The sun never set (we were there during the summer solstice) but we didn’t mind the long twilight 'nights.' We’d just lie back on our sleeping bags often listening to calving glaciers or birds looking for mates. We came upon brown bear (ie, grizzly bear) tracks on many of our day hikes and saw a few bears from a safe distance at other times. A memorable moment was watching a bald eagle soaring overhead, swooping around for a moment or two before diving near our raft to pick up its dinner of salmon. What a thrill it was to experience such remote areas of Alaska that most people never have a chance to see." before coming down my driveway. Contact Mary (Cornelius) Kretschman with reunion questions or to update your contact information. Steven Hoskins writes: "After 48 years in the packaging industry, serving as President of Pacific Inland Packaging Corp until 1992 when my company was purchased by Sunshine FPC, then continuing there as VP of Sales and Marketing, I retired in Nov 2016. My past credits include President of California Film Extruders and Converters Assoc., Chief of the YMCA Indian Princess Friendly Spirit Nation (a group of over 300 dads and daughters), and coach of many girls teams in baseball and tennis. After retiring, wife of 40 years Vicki and I "downsized" and moved to a new retirement community in Menifee, CA. We moved into our new house, added many custom features, had the house fully repainted on the inside, and landscaped both the front and back yards. Currently I am in recovery mode trying to get my golf scores back to the mid 80's. We both spend time with our 3 daughters and 5 grandkids who keep their grandparents young and active." Seated in front row is: Mr. Bert Froysland and wife Mae. He was our English Teacher. Contact Murry Idema or Phil Leech for additional reunion information. 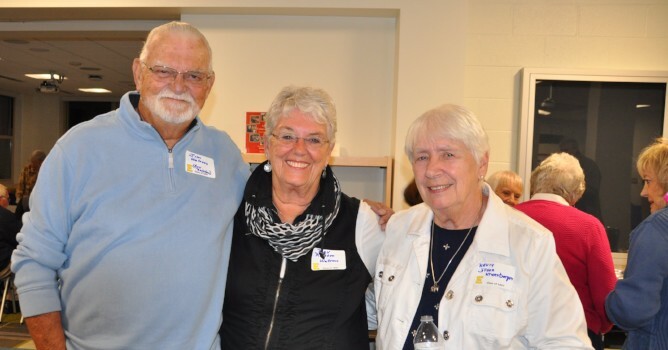 The Class of 1957 held their 60th Class Reunion over the October 13 & 14th weekend. Friday night was a beautiful evening so about 30 people took the bus to the football field to witness a celebration for our own Dave Mehney, who was honored at his retirement after 28 years as freshman football coach. Following the ceremony we traveled back to our old High School (which is now Wealthy Elementary School) to tour the facility, enjoy “Yesterdogs” and all their trimmings, and reminisce with old friends. Saturday afternoon about 40 people enjoyed a light luncheon and tour of the Brookby House (also known as the Blodgett Estate). For those who attended, the experience was extremely rewarding and informative. Saturday evening found 70 classmates and spouses at Reds at Thousand Oaks. We had folks from California, New Mexico, Oregon, Texas, South Carolina, Nevada, Kentucky and Florida. In spite of the inclement weather, all enjoyed a delicious meal and lots of conversation. Our delightful MC, Chuck Jennings, led us in invocation, and entertaining tidbits from days gone by. All in all, the weekend was perfect. Everyone enjoyed themselves and it was so good to catch up with old friends. We are now busy working on a class directory and will mail a copy to all our classmates when it is available. Before the 2017 Homecoming football game, Dave Mehney was honored for his 28 years of service as an East Grand Rapids football coach. Surrounded by family, friends, fellow coaches, and many of his former players, Mehney used the occasion to thank everyone who had helped him along the way. 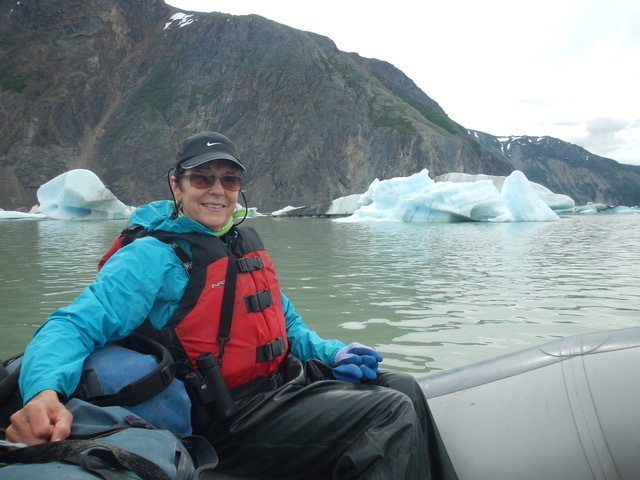 "For the last few years I have volunteered for work projects with the Sierra Club in the west. This year when unable to get the assignment I had hoped, I expanded google search for volunteer opportunities worldwide. This led me to www.wearebamboo.com. After reviewing the material and especially the reviews and discussing it with the US representative, I decided 'Two Countries: Thailand and Cambodia, for over 50’s' was the best choice. For two weeks we saw the most beautiful temples in Bangkok, mingled with Thailand’s gentle giants the elephants in 'the elephant village,' visited Cambodia’s World Heritage site of Angkor Wat, and built a palm house for a family outside Siem Reap, Cambodia. In Siem Reap we visited a most fascinating organization that trains HeroRats able to detect landmines and TB. Find out the fascinating information at www.apopo.org. All this with 20 lovely people 3 of which were from the US, the rest from the UK." 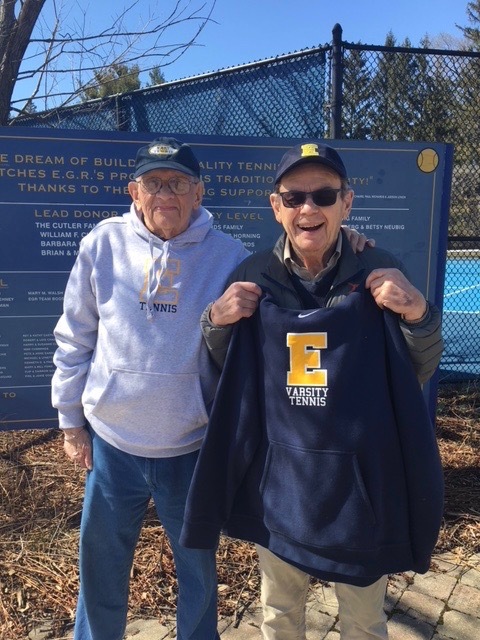 Longtime friends Dave Berles and Glen Young met up this spring at an East girls tennis match. It was the first one Glen had attended. Fortunately, Dave has been to a few over the years, so he knew exactly what Glen should wear. "We're in our seventh year operating an Honor Flight out of Lafayette. I've been a part of it since its beginning. As a retired Army Lieutenant Colonel, I had a vested interest in this program. It has been my way of giving back. "You can only speculate on the degree of pride we have being able to say that we've taken over 1600 war veterans to Washington, DC to see the memorials to their service. We started taking WWII veterans. After a few years, their numbers began to diminish, so we added Korea veterans, and now we take Viet Nam veterans as well. The emotions run high with some of the Viet Nam vets confronting their memorial wall for the first time. We gave these guys the parade they never got, and now, we see Viet Nam vets all over town wearing their hats proclaiming their pride in their service to their country in that war." 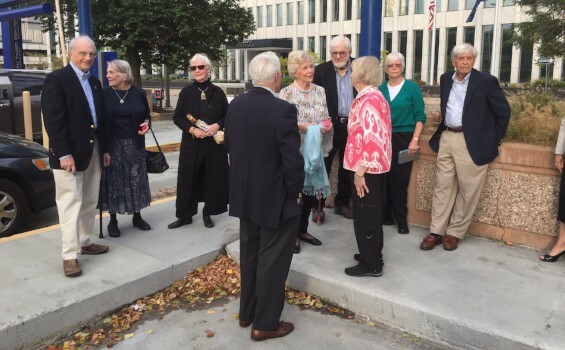 From Betty Jo (Muir) Crosby: "The Class of '52 had to develop 'Plan B' after their Saturday night reunion dinner on October 7 at the University Club was canceled because of a power outage in downtown Grand Rapids. An impromptu reunion planning meeting was held in the parking lot at the Fifth Third Bank building with cell phones going at full speed. 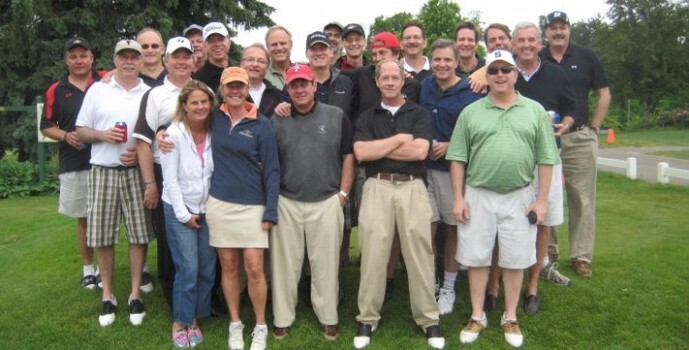 The party was moved to Kent Country Club where a very good time was had by all who made the connection. 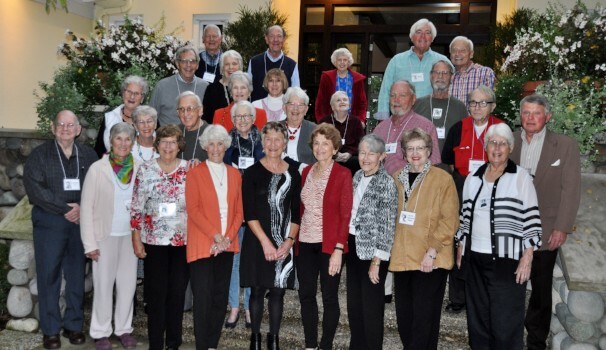 Alumni from Florida, North Carolina, California, New Mexico and Wisconsin as well as the 'local' alumni attended the reunion, which was the 65th for the class." 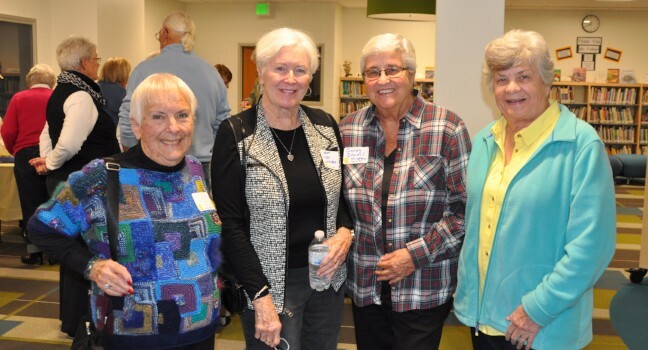 A few 1950 and 1951 alumnae gathered in August to reconnect and reminisce. Class agent: Contact EGRSF & Alumni Assoc. for information.